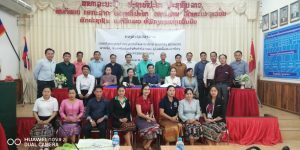 On March 28th, 2019 at the Department of public Health, Luang Prabang, Civil Society Organized in Luang Prabang held a meeting with authorities for exchanging a knowledge in nutrition. The meeting was get a good result as participants from NPA well understood priority and strategy, especially 22 priorities of nutritional strategy of the government. The thematic working Group is one of the activities in outcome2, Connect Project, funded by the European Union.